Dine in comfort and rustic style with this beautiful chair. Made from solid Acacia wood, this chair features a slightly curved wooden back with distinctive inlay design that adds a unique combination of rustic charm and contemporary polish to your dining room ensemble. The rustic gray finish of this chair beautifully highlights the wood grain, while its fabric upholstered padded seat provides comfort for long hours. Set this chair around your dining table to gather friends and family for dinner parties, or let it sit in the entryway to give guests a place to sit and kick off their shoes. 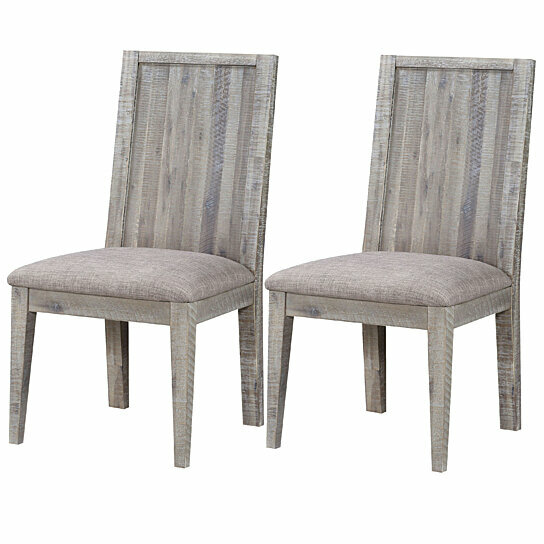 Note: Other featured items in image except this Dining Side Chair are sold separately. The wooden back of the chair features a distinctive inlay design that adds a rustic charm to it. The frame of the chair is made from solid wood, while its seat is upholstered in fabric. The padded seat of this chair provides comfort for long hours.